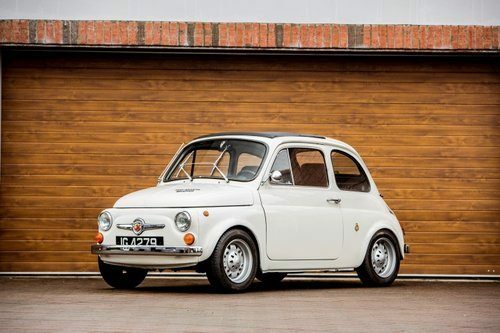 For Sale – 1970 FIAT-Abarth 595 SS Sports Saloon (1 of 7) | Classic Cars HQ. One of seven built 1970 FIAT-Abarth 595 SS Sports Saloon Registration no. IG 4279 Chassis no. 110F 2503119 * Iconic Abarth-modified FIAT * Restored in 2011 * UK registered since 2015 * Offered with its original Italian libretto 'The performance of FIAT engines, as modified by Carlo Abarth, has for long been held to verge on the supernatural.' – John Bolster, Autosport magazine. After leaving Cisitalia in 1948, Austrian-born engineer Carlo Abarth set up as an independent in Turin, the home of the Italian auto industry. From producing induction and exhaust systems, Abarth branched out into selling performance kits for - mainly FIAT - production cars, later building a highly successful series of aerodynamically-stylish sports prototypes and limited-series production cars. An innovative concern with a sporting pedigree second-to-none, Abarth was taken over by FIAT in 1971, becoming the Italian giant's competitions department. 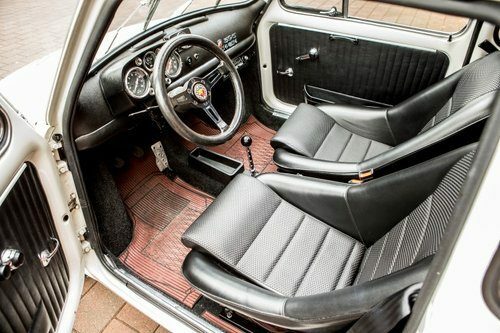 Abarth first turned its attention to FIAT's Nuova 500 in 1957, upping power from 13 to 21.5bhp, while increasing the engine capacity in 1963 for the '595' model raised the figure to 27 horsepower. Abarth had adopted the most cost-effective method of coaxing greater power from a small engine, a new big-bore cylinder block boosting the previously 499cc air-cooled twin to 593cc. Introduced the following year, the 595 SS (Sprint Speciale) incorporated further performance enhancements, resulting in a maximum output of 32bhp. 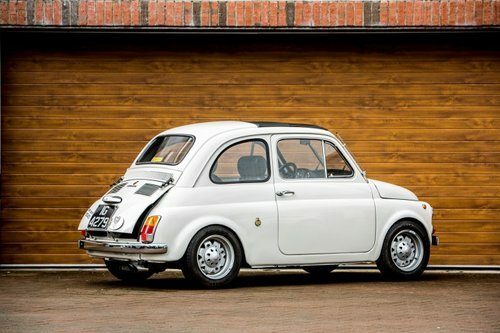 When FIAT launched the 500F in 1965, it adopted front-hinged doors on a revised and heavier bodyshell, a move that forced Abarth to respond by boosting the 595 SS's output by an additional two horsepower. Testing a FIAT-Abarth 595 for Autosport magazine in 1966, John Bolster declared: 'This is, of course, a much more costly process than the simpler tune-up of the 500, retaining the standard bore size, but the benefits are very great. An extra 5bhp or so is developed, but much more important is the far greater torque in the middle ranges.' Higher-compression pistons, re-worked inlet ports, a special camshaft and exhaust system, and a larger carburettor helped raise power to a claimed 30bhp, though as Bolster observed, the biggest gain was in mid-range torque. Abarth's conversion halved the standard car's acceleration times, and endowed the 595 with a top speed of more than 75mph. Lowered suspension and wider wheels and tyres helped the baby FIAT utilise the increased performance. Those still not satisfied could opt for the aforementioned 595 SS with 34bhp on tap and an 80mph top speed. There have been countless replicas created since, but the example offered here comes with its original Italian libretto confirming that it is an original FIAT-Abarth 595 SS. It is estimated that only 20 FIAT-Abarth 595 SS models were built by the factory; this car being one of a mere seven completed in 1970. Presented in wonderful condition, this FIAT-Abarth 595 SS was restored in 2011, and imported and registered in the UK in 2015. Finished in bianca with black interior, this very rare little FIAT is in concours/A1 condition. The engine is said to run like it should, and the car is a real thrill to drive. Bucket seats are fitted at present, and the original seats will be included in the sale. This very special little car will be sold with a comprehensive file to include the current MoT certificate, V5C registration document, and the aforementioned original Italian registration documents and paperwork authenticating it as a genuine SS.